Roughly 3,000 miles east of California’s Napa Valley, and even farther from France’s notable wine-making regions, lays Rhode Island, not always the top destination for wine tourists. This was the catalyst behind five southeastern New England vineyards; Little Compton’s Carolyn’s Sakonnet Vineyard, Newport Vineyards, Portsmouth’s Greenvale Vineyards, Westport’s Westport Rivers Winery, Clinton, Conn.’s Chamard Vineyards and Stonington, Conn.’s Stonington Vineyards; companies who would normally compete for tourism dollars, who banded together in 2006. These partners, known as the Coastal Wine Trail, “wanted to promote that they weren’t moonshine-making wineries, but a collection of wineries that existed within the designated growing region,” said Maggie Harnett, director of the Coastal Wine Trail and tasting room manager at Greenvale Vineyards. 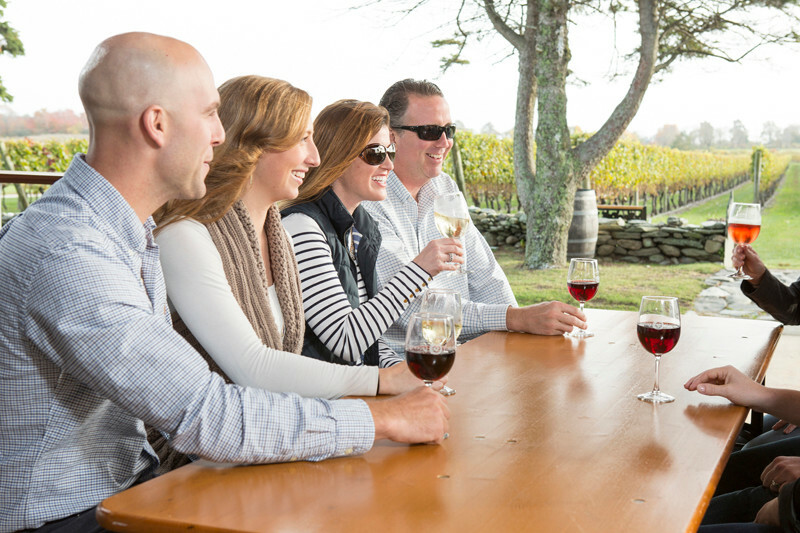 A decade later, the partnership has expanded to 14 vineyards, but the central goal remains: marketing and promoting local brands to locals and tourists alike, as well as the Southeastern New England American Viticultural Area, a federally recognized grape growing region. One of the more well-known accomplishments of the Coastal Wine Trail is the vintner’s ticket, a $99 tasting pass for two people, designed to help increase patronage at all involved companies. It allows visitors to pay a one-time, flat fee for tastings at all 14 vineyards rather than separate fees at each vineyard, which would cost more when totaled. “It bolstered sales,” said Harnett, who explained guests with the pass more often purchased wine at on-site retail stores than those who paid full price for the tasting. The 5-year-old Coastal Wine Trail’s annual festival has seen increased visitor numbers, 1,786 people in 2016 from 1,234 in 2012, and more than $27,000 in profits in 2016. To date, in 2016, the partnership has brought in close to $36,000 in year-end profits, five-times that of 2015, double 2014. Newport Vineyards, a founding participant, cites the partnership as a positive way to keep wine tourists in the area. The biggest benefit of the Coastal Wine Trail is that visitors follow through on recommendations Nunes and the staff provide when asked for other local vineyards to visit. Although Newport Vineyards has one of the larger vineyards in the area, Nunes admitted he likes to share the wealth, calling the partnership “a nice introductory opportunity” for the consumer. Neither Discover Newport nor the Newport County Chamber of Commerce tracks wine tourism, specifically. However, the county’s meal and beverage tax (11.9 percent) and hotel tax (27.4 percent) both illustrate large year-over-year increases in general tourism since 2015. “Sometimes it takes 25 years for vineyards to establish themselves,” said Nunes. Due to a large expansion, and increased tourism from the Coastal Wine Trail, visitation to the vineyard doubled, said Nunes. He estimated it grew from approximately 50,000 annual visitors to 100,000 and held there for the last five years. In addition, wine production increased from 15,000 cases annually to 25,000 in the same time frame. While Marco Montez, owner and winemaker at Travessia Urban Winery in New Bedford, could not provide similar data, he recognized the importance of the Coastal Wine Trail partnership early, joining months after opening in 2008. A partnership such as the Coastal Wine Trail, however, stretching across three states and 14 separate companies, is not likely to exist without some discomfort. Montez said when the vintner’s ticket was first introduced, not everyone was onboard. “At times, as you can imagine, it’s not easy to get everyone to agree – it’s a group, people don’t always see everything the same,” he said. For Travessia, said Montez, partnership in the Coastal Wine Trail has not impacted the programming he offers or varieties of wines he makes, but, overall, he has had a positive experience because it brings more people in the door, diversifying clientele. While the premiere focus of the group is marketing, there is one requirement to partnership in the Coastal Wine Trail, which touches on the organization’s roots: some of a participating vineyard or winery’s fruit must be grown locally, within the SNEAVA.